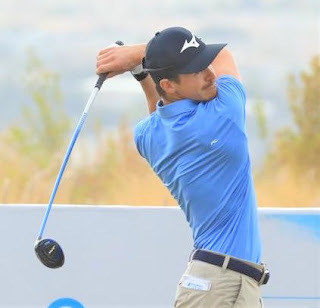 The Dutchman, who plays on the European Challenge Tour, birdied half of the holes at Ayla Golf Club against only one bogey to card an opening round of eight -under par 64. The sublime score will give Huizing a one-shot advantage over two golfers from England — fellow Challenge Tour player Jack Senior and Ladies European Tour player Meghan MacLaren. Day One at the Jordan Mixed Open presented by Ayla gave the entire world of golf an important first-look at a format which allows men, women and senior golfers to compete in the same field. MacLaren, who has been a vocal advocate for the strength of the women’s professional game, wasted no time in backing up her words, as she carded birdies on her first two holes and rode the momentum to post the early target of seven under par. When the high winds forecast for the afternoon failed to materialise, several players, including Huizing, Senior and 2018 Staysure Tour Rookie of the Year Paul Streeter took advantage. Streeter’s six under par 66 was the low-round amongst the over-50s contingent and placed the Englishman firmly in the mix with two rounds to go. The innovative tournament sees 40 players from each of the Challenge Tour, the over-50s Staysure Tour and the Ladies European Tour compete for the same trophy over 54 holes. With the golfing community eager to see how the course set-up would play out, the opening round of the Jordan Mixed Open presented by Ayla was a great success with players from all three Tours in contention and well represented inside the projected cut line of even par. Challenge Tour players played the first round from approximately 7,100 yards, Staysure Tour players from 6,601 yards and Ladies European Tour players from 6,139 yards. The unofficial battle for low-couple is heating up with Ladies European Tour Order of Merit leader Marianne Skarpnord and her fiancée, Challenge Tour player Richard Green, combining for a two under par total, while married golfers Kyle Henry of the Ladies European Tour and Scott Henry of the Challenge Tour combined for a one over par total. Tournament officials collected data on driving distance, approach shot distance and club selection from every player who competed on Day One and will incorporate their findings into the course set-up for Day Two to continue to ensure the fairest possible playing field for all competitors. The second round of the Jordan Mixed Open presented by Ayla will begin tomorrow at 7:30 am local time before the 123-player field is reduced to the top 60 players and ties for the final day. Daan Huizing: “It was a really nice round. I was hitting it nicely and made some nice putts to keep the round going as well. I enjoyed it. It was pretty chilled and it was good fun. “It’s a different perspective to play with the seniors and play with the ladies. It was a nice, relaxed day, and I think being relaxed helped me play well. Meghan MacLaren: “If I’m going to write about it and talk about it all the time, then I’d better back it up with my golf. I’m delighted to do it in this tournament, particularly. Hopefully it will send a bit of a message, but any time you shoot seven-under in a tournament, you’re not going to be too far off the lead. Hopefully this means a few more people will be watching. Jack Senior: “I think you’ve got to enjoy this format, but it’s hard to know how it’s all going to pan out at the end of the week. I’m sure, though, that it will be a successful event and continue to be. Paul Streeter: “It was brilliant out there. I really enjoyed it. I think the tees were fairly good and I think we were very close to each other on most holes. A few were different but that also depends on how you strike it and the slopes you land on, but it seemed to work really well. It’s a great format and it’s something new for everybody." Kylie Henry: “It’s been a really fun week and it’s just nice to be at a tournament together because usually the Tours are in different countries and sometimes different continents.